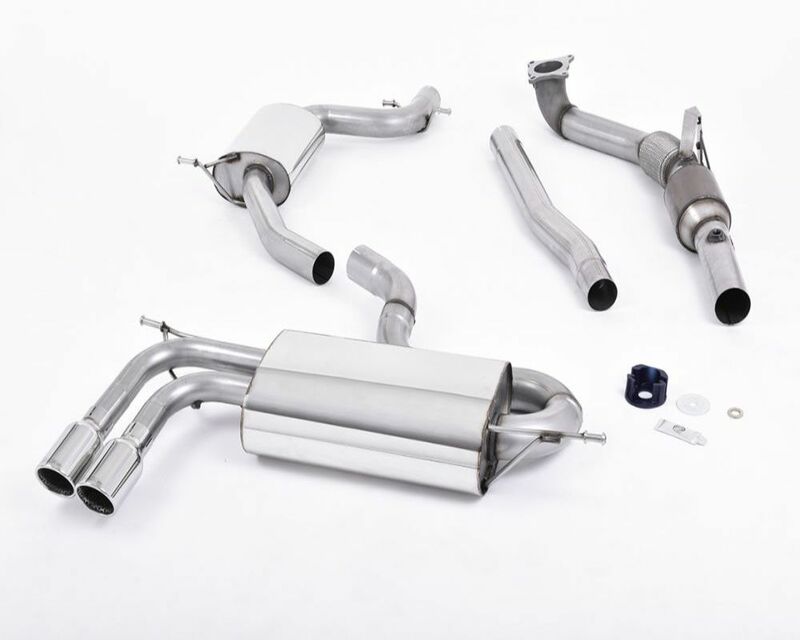 Your original catalytic converter will typically have 400 or 600 cells per square inch (cpsi), these original cats are restrictive in their flow, typically allowing an open area of around 55-65%. A Milltek Sport Hi-flow Sports Cat which will be fully integrated into a large bore downpipe, has only 100-200 cpsi depending on application. These cats have an open area of between 75-85%, thus reducing back pressure substantially and increasing flow rates, all very desirable for extracting more performance, especially on turbocharged engines. Milltek Sport Hi-flow Sports Cats are made from a special stainless steel containing aluminium (called Fecralloy). This material was developed in England in the 1970s specifically to provide resistance to oxidation at very high temperatures. The material is used as a very thin strip (2 thousandths of an inch) and is coiled together to make a honeycomb structure. Because the metal strip is so thin, the honeycomb has a very low flow-obstruction. To reduce the flow-obstruction even further, the honeycomb is made with 100 or 200 cells (i.e. channels) per square inch compared with 400 or 600 per square inch for a standard catalyst. The result is that about 85% of the total cross-section is open. Requires a Stage 2 ECU remap to get best proformance. Milltek Sport hi-flow sports catalysts are designed to work specifically in conjunction with other Milltek Sport products and should not be used on their own (with the OEM exhaust system) or with other manufacturers exhaust systems. If the Milltek catalysts are fitted with non-Milltek exhaust systems, we are unable to provide any guarantee regarding noise quality, fit, performance or warranty against their operation. More than 29 years of continuous exhaust development and technical expertise are drawn upon to develop the ultimate Milltek Sport range of performance products, offering an ever-expanding comprehensive selection of performance exhausts which build on the successes of key marques like Audi, Volkswagen, Porsche, BMW and Nissan. This has placed Milltek Sport at the forefront of tuning companies and owners must have list. Milltek Sport have appointed key distributors and are currently exporting to nearly 80 countries around the world.